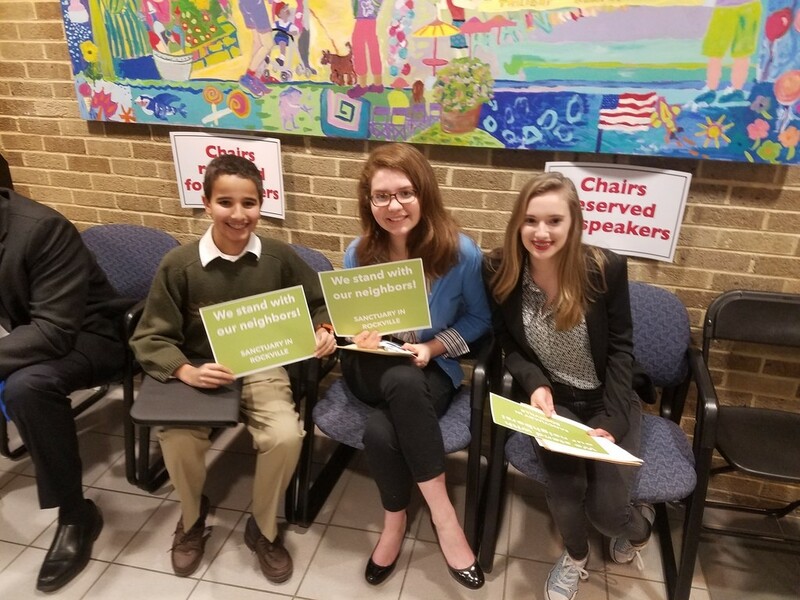 Richard Montgomery HS students Ameen Elhamdani, Lydia Levy, Isabelle Young before testifying for proposed City of Rockville ordinance 11-3, “Fostering Community Trust.” More photos here. Scores of local residents testified about a proposed City of Rockville sanctuary ordinance at Monday night’s Rockville City Council hearing. While not all speakers favored the ordinance 11-3, “Fostering Community Trust,” (sponsored by Councilmember Julie Palakovich Carr), a majority did as a supportive audiences watched in multiple overflow rooms. Video of the evening’s testimony is now available on the Rockville city web site. Our own videos of testimony (off the TV screen in a viewing room) and interviews outside the hearing room are grouped in the YouTube playlist below. It includes testimony by Carol Schlenker, two of the Richard Montgomery High School students (Lydia Levy and Isabelle Young), and Sue Udry, as well as interviews with all three students, former Councilmember Tom Moore, Rockville Human Rights Commissioner Ben Shnider, and Montgomery County Councilmember Sidney Katz. I was present at last week’s mayor and council meeting, and we all—every one of us in the room—shared a proud moment recognizing Rockville’s status as the ninth most culturally diverse small city in the US. We applauded! The City of Rockville Twitter account recognized this news with the hashtags #proud and #Diversityisourstrength. I agree. The question for all of us here today is how much that diversity truly matters to us, and whether—when push comes to shove—we’re capable and willing to stand up for our diverse community. I have three children ranging from 7 to 15 years old who currently attend MCPS. They have seen the effects of the current immigration policy first hand. They have seen the look on their friends’ faces when they hear about ICE raids. The people that the current Executive Order targets aren’t some sort of shadowy ‘other’. They are the parents of our children. They are business owners. They are friends and family members who simply want to go about their lives peacefully. We are a nation of laws, and this is a moment to pass a law. A law that says that the City of Rockville will protect – not punish – those who call upon it for help. 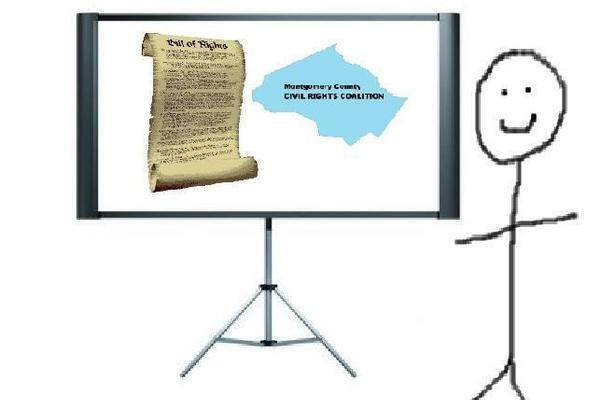 A law that tells the terrified children in Rockville that this City will play no part in deporting their parents, no part in destroying their families. A law that best protects City taxpayer funds. A law that says: We stand for all of our families. We stand for all of our children. Opponents of this ordinance frame as a choice between crime and law-and-order, or pit undocumented immigrants against those who hold legal status. Based on my 7+ years volunteering at FJC, this is not only wrong, it’s dangerous. Our city and county should not discourage undocumented women and men from reporting domestic violence and other violent crimes, for their safety, their children’s, and our entire community’s. Under our current unofficial policy, we don’t have to choose between public safety and protecting the rights of otherwise law-abiding undocumented immigrants. This enlightened, effective, local policy is now under threat, and for that reason I urge the Mayor and Council to protect all peace-loving residents of Rockville and codify it into our City Code. We as descendents of immigrants are uniquely positioned to provide a safety for those seeking a haven We must not squander this opportunity- let us welcome those who are in need of support- who want to start a new life for themselves and their families. As the City Council considers this ordinance; it is legitimate-to look into possible financial repercussions based on threats made in a January 25 Executive Order to find ways to cut funding from so-called “sanctuary jurisdictions.” It is important to note that many Constitutional scholars have declared that such cuts would be unconstitutional and likely halted by the courts. They argue that trust policies, such as the one the Council is considering tonight, are an exercise of basic state and local powers to regulate for the health, safety and welfare of their residents, and the Trump Administration cannot commandeer the Rockville police to enforce federal immigration policy. I cannot begin to imagine the fear that some go through. As students, we should be focusing on education and making our lives better, not live with the constant thought that we might not be in school tomorrow because of being labeled as an illegal immigrant We are all immigrants, except for the native americans .. How can we blame them for attempting at a search for a new and better life? It’s not their fault they are in this situation, they did not ask for it. For an ongoing list of all testimony forwarded to MCCRC, visit our “Rockville Testimony” collection at scribd.com.